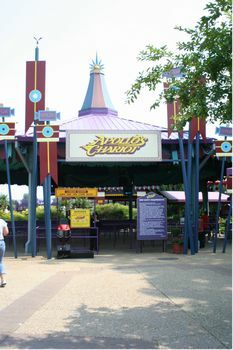 Apollo's Chariot is an excellent roller coaster in Festa Italia and one of the best attractions at Busch Gardens Williamsburg. The minimum height to ride is 52 inches. Born of myth and imagination, Apollo's Chariot soared high up on the list of favorite coasters when it debuted--and hasn't come down since. While it's consistently ranked as one of the top 10 steel coasters in the world, few rides come close to the experience waiting for you here. Like the Olympian sun god, Apollo's Chariot races toward daring heights, only to dazzle riders on the way back down with one of the smoothest, fastest trails ever blazed. From mind-bending 4G climbs to the weightless wonder of floating airtime, you'll see what has kept coaster enthusiasts coming back for more year after year--and why Apollo's Chariot reigns as one of the mightiest coasters of all time. This is a wonderfully smooth, beautifully done coaster with lots of fluffy cloud airtime that justifies its name. No loops. No tricky turns. No hidden surprises. Just expertly laid out track surrounded by trees and water. I'm a little surprised this ride consistently makes Top 10 Coasters lists. As I mentioned, it's an excellent ride and a crowd pleaser, perhaps because it's not too intense or unpredictable. It could be the Forrest Gump of roller coasters: immensely popular, feel-good in nature and re-watchable, but without indie crowd fandom. More interesting coasters have made the scene in recent years. Smooth, graceful, fast, and thrilling, Apollo’s Chariot is a non-stop thrill ride that should be at the top of every coaster fan’s must do list.